Raviraj Godse has started his own business recently and earns Rs 1 lakh a month. He stays in Navi Mumbai with his wife, who is employed and earns Rs 10,000 a month, and two children, aged nine and six. After considering a rent of Rs 12,000, their total monthly income comes to Rs 1.2 lakh. They live in their own house worth Rs 58 lakh, while another, worth Rs 40 lakh, has been bought as an investment. They have an outstanding home loan of Rs 21.4 lakh, for which they are paying an EMI of Rs 20,551. They have also taken another loan of Rs 2.5 lakh from family and friends, which they want to repay in a couple of years. Their goals include building an emergency corpus, saving for their kids’ education and weddings, buying a car and another house, taking a vacation, and saving for retirement. The financial planning team from Fincart suggests that they put on hold some of their goals, including kids’ weddings, vacation, and purchase of car and house, due to lack of surplus. They should also sell the second house and use the proceeds to reach some of their goals. They can start by building the emergency fund of Rs 2.7 lakh by allocating their cash and investing it in a short-duration debt fund. 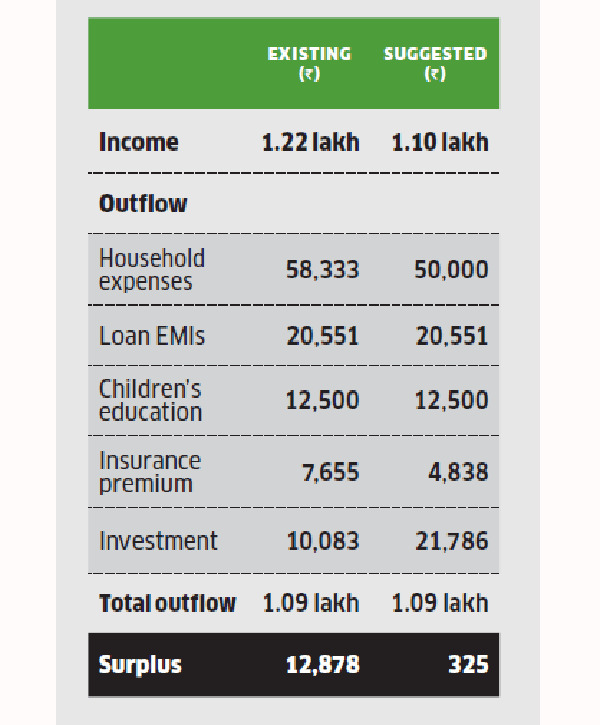 For the remaining Rs 20,000, they can use any surplus from their cash flow to build the amount. 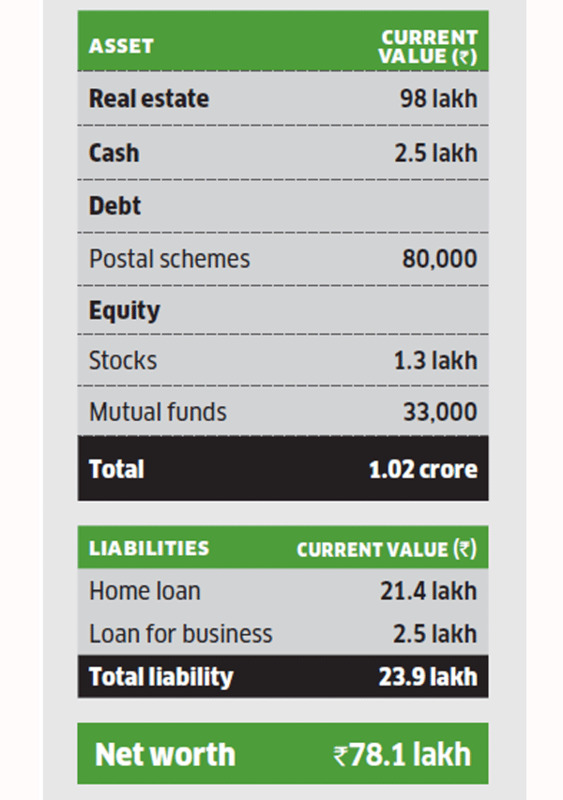 To repay the loan of Rs 2.5 lakh in two years, they can invest Rs 4,703 in a low-duration debt fund. 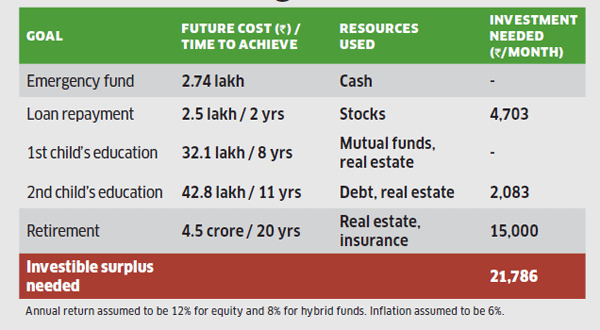 For their older child’s education in eight years, they need Rs 32.1 lakh and can build it by allocating their mutual fund corpus and a portion of their real estate sale proceeds. 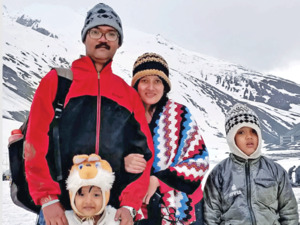 To amass Rs 42.8 lakh for their second child’s education in 11 years, they can allocate the postal scheme and a part of the real estate sale proceeds. For retirement in 20 years, they will need Rs 4.5 crore and can assign their remaining proceeds from the sale of the house, as well as the insurance surrender value. In addition, they will have to start an SIP of Rs 28,254 in an equity fund. 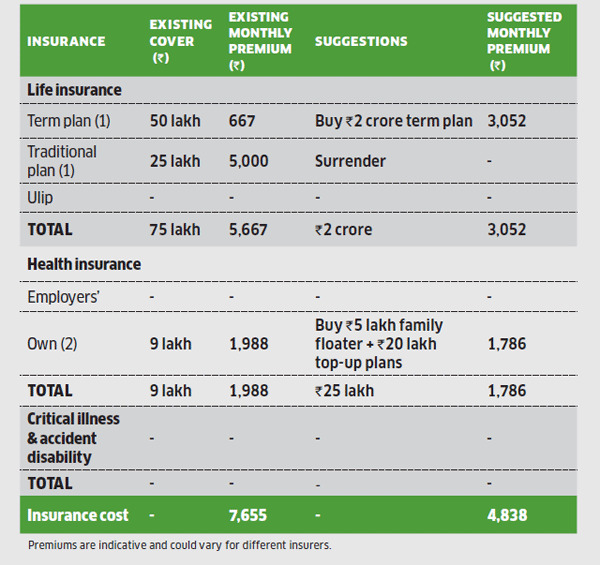 For life insurance, Raviraj has a term plan of Rs 50 lakh and a traditional plan of Rs 25 lakh, for which he is paying a premium of Rs 5,667 a month. He is advised to surrender both and buy a term plan of Rs 2 crore at a premium of Rs 3,052 a month. For health, the couple has two plans worth Rs 9 lakh. Fincart suggests they close these and buy a family floater (Rs 5 lakh) and a top-up (Rs 20 lakh) plan for Rs 1,786 a month.